Have you seen the old TWITTER on which after every refresh the site changes it's background image not only twitter the old AOL was doing the same and many other major and minor sites are doing it. 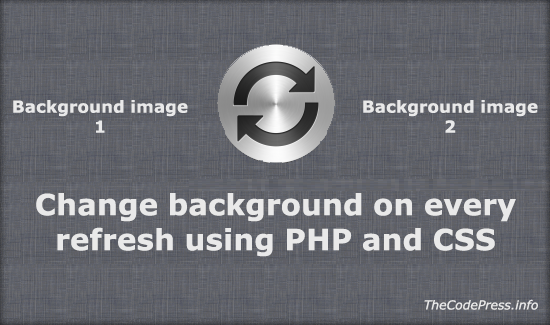 By using this method you can also change the background image of your website. In this post i have implemented few lines of code which will help to change your sites background image on every refresh. Don't forget to check the live demo. I have made a folder which name is Backgrounds, and in that i added this images with same extension and numerically sorted. Now, we are ready to use PHP to make the function work. PHP: Few lines of PHP code can do many things!. We are using a rand() to get random numbers and assigned it to a variable $bg. Now we got random number and now we need to add extension to it. All my backgrounds images are in .JPG format (If any of your image is in other format you can download any image converter and convert it to a suitable format). If you will print $bgchange variable you will find any number between 1 to 5 with .JPG for example : 1.JPG or 2.JPG etc..
CSS: Changing Background of HTML document with CSS. And the function bg_change() should be called in body tags <body>...<body>. HTML : Calling bg_change() function in body. For background Images you can download it from Flickr or Google Images and other services. Also you can buy it from other online services. how to do this using smarty templates ?